September is usually the time of year where you’re still not sure whether you’d rather be sitting back and enjoying the last ounce of summer or to start working on the garden again. There are still a few things to keep in mind to keep it looking good. Prepare sites for new lawns, as September is an ideal time for sowing. The area should be level, free from large stones and weeds. 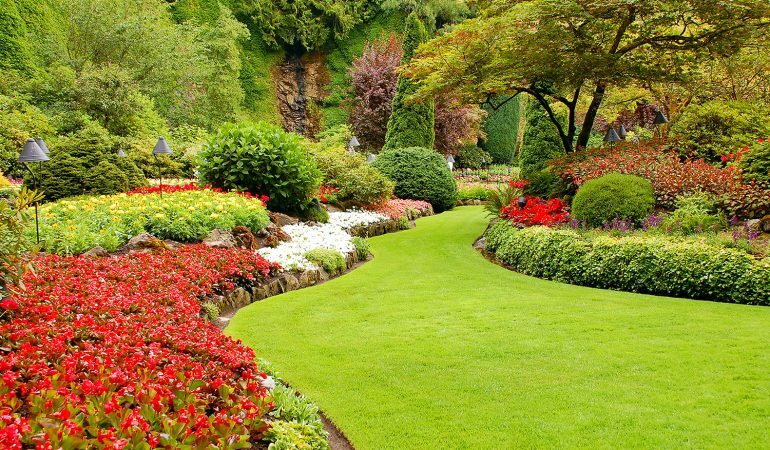 The growth of your lawn should start to slow down a bit now, time to catch up on the rest of your garden. Get your compost going by buying a compost bin or building a partially enclosed and easily accessible area for a heap. It is essential to replace the goodness in soil and autumn produces quantities of garden waste that will add invaluable organic richness back into your soil next spring. Remember to add a variety of different materials; spent vegetable plants are ideal, but NEVER add diseased or pest-ridden material to your compost heap – it will nurture whatever villain you are trying to eliminate with loving care! Keep weeding; most perennial weeds are susceptible to weedkiller this month and systemic weedkillers will carry on working throughout the winter. Also clear any debris and diseased material from your garden. Pests and diseases that stay in your garden over the winter will reappear next spring with a vengeance so get rid of them now. Burn diseased material and put the rest of your garden rubbish (apart from woody stems) in the compost. If your soil is heavy clay, start digging it over now – add plenty of organic matter to improve the quality and pea shingle to improve the drainage. It can be left in a pretty rough state over the winter when the cold will break the lumps down, making spring planting infinitely easier! Should September turn into an Indian summer, remember to keep watering thoroughly once or twice a week rather than little and often. Containers and hanging baskets need watering every day. For recently planted large shrubs or trees, leave a hose trickling around the base for an hour. The same goes for established plants in dry periods – camellias, rhododendrons, azaleas and hydrangeas will abort next season’s flowers if they get too dry. Ensure trees or shrubs planted in the last couple of years on lawns or in areas of rough grass have a circle of clear earth around them – this MUST be kept clear or grass will prevent essential moisture getting through. Mulching with bark or compost will help. With the ideal planting conditions of autumn (warm moist soil), now is the time to plant container grown shrubs, trees, fruit bushes, perennials and bulbs. The key to successful planting is to water in well. Soak the rootball in a bucket until no air bubbles come to the surface, dig the planting hole, fill with water and allow to drain away. Place the plant in the hole, fill with soil, firm gently and water well with a watering can – this will give the plant a huge advantage over one planted with a dry rootball in a dry hole and watered only on the surface.